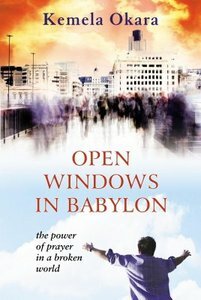 Open Windows in Babylon is a fresh and exciting new look at how crucial prayer is for believers worldwide-especially in these desperate times. Through the wisdom and personal experiences shared in this book, you will go beyond ordinary prayer into the supernatural realms of prayer to touch God and release the supernatural in your life. · Recognize and deal with hindrances to prayer. · Go to a new, higher level of intercession. · Combine prayer and fasting. · Look to Jesus as the perfect example. Open Windows in Babylon-The Power of Prayer in a Broken World covers subjects and examines Scriptures not normally found in traditional books on prayer. From his many years of global ministry and counseling, author Kemela Okara shares how you can receive a powerful anointing that will spill over into every dimension of your life. "To live victoriously and to be tools in the hands of God to advance His Kingdom, we need the oxygen of prayer," writes the author. About "Open Windows in Babylon: The Power of Prayer in a Broken World"
Kemela Okara is a lawyer, pastor, author, and politician. He trained as an English Barrister and practices law in Nigeria. He was also a missionary with The Redeemed Christian Church of God. Kemela is the resident pastor of This Present House in Lagos, Nigeria. He sits on the board of KSF Micro Finance Bank and is a Trustee of Freedom Foundation. He and his wife, Chineze, have four children.